ABOVE: An adult conductor greets passengers in the Am Strassburger Platz station. Dresden's Parkeisenbahn, or Park Railway, runs some 5.6 km, or 3½ miles, through the Grosser Garten (Great Garden) on the eastern edge of the city center. 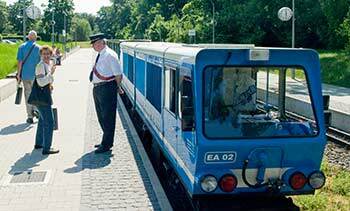 Unlike many park railroads, it isn't just a fun ride: It's also a useful means of transportation, taking passengers from the Altstadt to outlying areas of the large park--including the Zoo Dresden and the Carolasee, a.k.a. Lake Carola, where visitors can rent boats or enjoy drinks, meals, and snacks at the Carolaschlösschen restaurant and café. In the days of the Pioneers (Communism's version of the Boy Scouts and Girl Guides), the Dresdner Parkeisenbahn was operated largely by children. That tradition continues today, with children volunteering for uniformed railroad jobs in their spare time. Over the years, thousands of children have welcomed some 22 million passengers to the "Pioneer Railway" (as the railroad was known from 1951 until 1990). The Dresdner Parkeisenbahn operates from spring through fall, with special Advent rides in early December. For travel information in English, see the Dresden Park Railway Web site. Tip for railfans: While you're in the city, be sure to visit the Dresden Transport Museum. Also see: Dresden, Germany -- Our 8-page city guide and related articles on the capital of Saxony.